Just as every state in the U.S.A. claims a state flower, each of Canada's ten provinces and three territories have adopted an official "floral emblem." The history of the white trillium as a Canadian floral symbol dates to World War I, when members of the Ottawa Horticultural Society proposed this wildflower as a national floral emblem, appropriate for planting on graves of Canadian servicemen overseas. Although Canada's government ultimately never assigned a national flower, Ontario officially declared Trillium grandiflorum its provincial floral symbol on March 25, 1937. Trillium is also a much-loved native wildflower in the U.S. In 1986, T. grandiflorum took its place alongside the Ohio state flower, red carnation, as the state’s official wildflower. 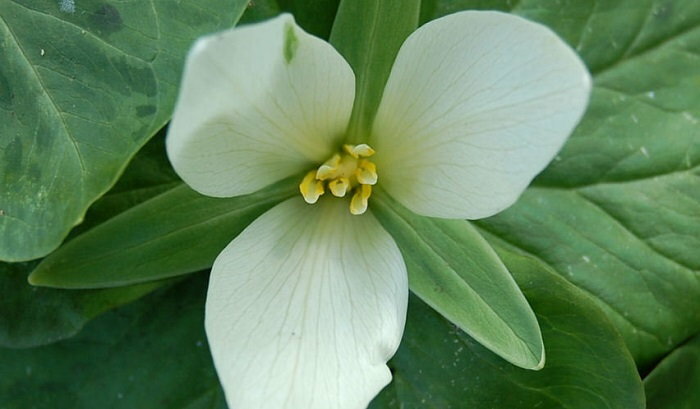 Ohio’s General Assembly chose the white trillium since it grows in each of the state’s 88 counties. The name “trillium” derives from the plant’s repetitions of three. Each plant produces a whorl of three broad leaves with a three-petaled blossom on a single stem. This particular trillium is also called the trinity flower, great white trillium, wood lily or white wake robin. As its scientific name suggests, T. grandiflorum is the showiest of all the trilliums, with flowers measuring up to 3 inches long. The waxy white blooms are long-lasting and tend to turn pinkish as they age. Plants can reach as high as 18 inches. T. grandiflorum, like other ephemeral species such as Virginia bluebells (Mertensia virginica), Dutchman’s breeches (Dicentra cucullaria), trout lily (Erythronium americanum) and spring beauty (Claytonia virginica), betrays its presence above ground for just a short time each year -- after the snow melts, but before the woodland trees leaf out and completely shade the forest floor. These delicate spring beauties bloom, are pollinated, set seed and die back to the ground within just a couple of months each spring. T. grandiflorum makes its appearance in May and June, and is native to woodlands of North America from Maine to Quebec, south into Georgia and Arkansas and west into Minnesota. Like many other spring ephemerals, the seeds of the trillium are dispersed by ants -- a process called myrmecochory. The plant's seeds contain a food attractive to ants, called elaiosomes. The ants carry the seeds to their nests to feed their larvae, then discard the undamaged seeds. This allows the trillium to produce a new plant in a nearby location. 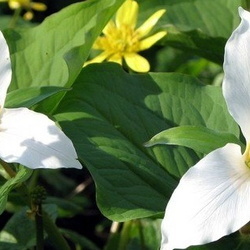 Native Americans sometimes gathered and chewed trillium root stocks as a medicine. They used it as an antiseptic and diuretic by boiling the plants with animal fat and using the resulting concoction as a poultice. The roots were boiled in milk and used as a treatment for dysentery and diarrhea. They also cooked the leaves and ate them as a potherb, but the plants are protected today, so harvesting from the wild isn't recommended. The trillium has a lifespan approaching that of a human -- it requires some 17 years to reach maturity, and may reach 70 years of age! Although T. grandiflorum is native to zones 5 to 8 and grows throughout the eastern U.S., it will not thrive in just any garden. To be successful with this species you must give it the same conditions it enjoys in its natural habitat -- moist, well-drained acidic soil in dappled sunlight. Plant the rootstock 4 inches deep in a humus-rich environment. You can simulate the trillium’s forest habitat by providing a mulch of rotted or shredded leaves at the beginning and end of the season. 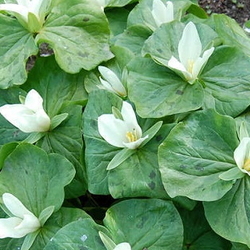 In your own garden or wooded lot, you can propagate trillium most easily by division in the late summer or early fall. You will need to mark the plants’ location in the spring before they disappear and go completely dormant. Sadly, the trillium’s beauty is actually a detriment to its survival. Many people simply cannot resist picking the white blossoms, which prevents the plants from reseeding. If the leaves are picked as well, the whole plant may die. Poachers or otherwise well-meaning plant lovers may uproot whole patches of trilliums, which also disturbs the slow-growing rootstocks of neighboring plants. 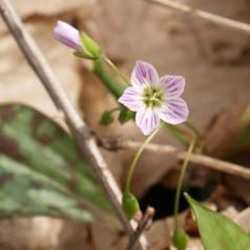 T. grandiflorum is listed as endangered in Maine and “exploitably vulnerable” in New York. In many states, it is illegal to pick this wildflower. Be sure any trilliums you purchase come from a reputable nursery and are propagated from cultivated stock, not collected from the wild. Special forms of this wildflower include T. grandiflorum f. roseum, whose flower petals open, and not just fade, to a light pink color. A naturally occurring sport with double flowers, T. grandiflorum ‘Flore Pleno’, is much sought-after by collectors. Relatives of the large-flowered trillium include the nodding trillium (T. cernuum), the red trillium (T. erectum) and the toadshade (T. sessile).